The big thing for us is that we live to see another day after our win in Game 6 on Wednesday night. Hopefully it gives me another day to get ready and help us win a game. If we make the World Series, my main goal is to be healthy enough to be included on the Fall Classic roster. I feel pretty good, and my injured Achilles tendon is coming around. But it takes time. Like anything else, you don’t want to do anything stupid to jeopardize your team’s chance of going to the World Series. It’s tough being on the bench and not being able to contribute. It’s terrible, but it is what it is. I’ve learned not to let your emotions get too high and just go with the flow. And if I get an opportunity, I will try and make the most of it. I’m not trying to be a coach or anything on the bench. I’m just taking it all in and hoping the guys do good and we get to the next round. I’m just being a cheerleader in the dugout. I even start singing that song for Jose Reyes. I love it, the fans love it. They appreciate a player like that and I find myself chanting it — even in the car on the way home. Everybody was chilling on the plane ride home from St. Louis after Game 5 on Tuesday night. We felt good coming home. We were happy to get out of St. Louis and get back home to our fans. We play well here at Shea Stadium, so nobody was really worried about us possibly being eliminated from the postseason. It was tense and tight on Wednesday. Everyone was stressing a bit, but we just had to get the job done. There are kind of similarities to when I was playing in the postseason with Florida in 1997. But you just have to get it done. Hey, the Cardinals are going through the same thing, but they’re in a tougher environment. If they can win here, you just have to tip your hat to them. This is a crazy place. We sense it’s going to be tough for them when we’ve got the crowd on our side. In St. Louis, it was nothing. We felt like we could deal with it. The crowd never got into Game 5. They were a little loud, but nothing too distracting. Playing there was nothing. Manager Willie Randolph probably will say the same thing to me about my chances of playing. I don’t even think that if I said I felt pretty good he would mess with the chance of playing me and jeopardizing getting injured even worse. So, right now, I think we’re stuck with what we got. I made this bed, so I need to lie in it. When I came into to pinch-hit in the ninth inning of Game 5 of the National League Championship Series, my first thing was to see some pitches and get myself a good at-bat, which I did. I got to 2-0. When I grounded out to first base, I felt pain in my left Achilles tendon as I was running down the line. It’s really uncomfortable. I saw Albert Pujols run to the base and I never had a guy that far away beat me to a bag. But my teammates know that I am trying my best. That’s all that matters. I have to have surgery on the Achilles in the offseason if I want to play again. I’ve been looking forward to playing healthy for the last six or seven years. Hopefully we will win the World Series and it would be a great offseason to have the surgery. I will have no doubts or anything. Hopefully somebody will give me the opportunity to help. Monday’s rainout gives me another day to get healthy. It will give me a chance to get healthier and get out there to help us win a ballgame. That’s the main thing here. I don’t want to put my team in a position where I go out there and come out in the first inning. I can’t do that. I have to make sure that I come here Tuesday early, get myself ready to go. Once I get to the ballpark, I will get treatment and do my normal activities, tape it up and get sweaty. I have to make Willie Randolph believe that I’m ready to start Game 5. He feels good about his lineup right now and I have to find a way to get back in. During practice, I will have bench coach Jerry Manuel hit me some balls in the gap and over my head. I want to see if I can get good jumps on them. We have Tom Glavine pitching Tuesday and his defense will play a big role on how he does. When you have a pitcher like Glavine, you have to be ready. He is looking for a spectacular play. He wants the routine plays made. Everybody knows that I’m not feeling well, but that doesn’t matter when it’s the playoffs. We definitely needed this victory Sunday night against the Cardinals. We just came out and did what we did all year. When we score runs, we score in bunches. With Oliver Perez being young and inexperienced in this postseason situation, we kind of thought that he might be all right out there. He gave us a solid start. In these types of situations, you never know what’s going to happen in the playoffs. I was very happy that he was able to keep us in the ballgame. The series is going back to New York and I like our chances. That’s what you play this game for. Everybody feels good about themselves. We help each other out. When you win, as I saw in 1997 with the Marlins, all 25 guys have made a contribution in some way. When you have that, it makes you feel good about your chances. Hopefully I will get healthy and help us. I’m pitch-hitting right now. Hopefully, I can get a little healthy and go back on the field. If the game is rained out Monday, it would help everybody, especially me. It would make everybody feel better. If we don’t get the rainout, let’s play ball. If there’s a rainout, I would look forward to starting on Tuesday. That would be another day off for me. It would help me out. If Willie Randolph feels comfortable putting me out there, I will go. The Achilles tendon is weak. I don’t want to hurt the team. When you care about the guys on the team, a lot of things come into play. It has been a rough few days, so it was good to hear from my old buddy Mike Cameron on Friday. It really helped. I think everybody knows how close we are, and he just wanted me to know he was with me, supporting me, hoping everything works out all right with this injury I’m dealing with now. Cam is great at eliminating the negative part of anything. I think anyone who has known him and played with him would tell you what a great presence he is in a clubhouse. Ask people around the league who they’d want to play with, and Mike Cameron is a name you’d hear from a whole lot of them. Basically, he said, "Hey, if you can do it, do it." He didn’t say, "I understand if you can’t." He doesn’t think that way. He’s all about putting positive thoughts in your head. So much of this game is your mental approach. If you allow yourself to be mentally ready, 90 percent of your job is done. The other 10 percent is to go out and play. I’m trying to do everything possible to get this Achilles tendon working right again. We’re taping it, and when the tape comes off I feel better, but it does give me some stability on it. I did some hitting Saturday before the game, and it felt better. I could have pinch-hit in the game if they’d needed me. I’m hoping it will feel even better Sunday. How I run before batting practice, how it responds, that will tell us a lot. At least I’ll know where I am. I won’t go out there feeling like I did in Game 1 after I ran to first in that at-bat. I want to get the thing fixed. I just look forward to enjoying it again. It’s no fun when you can’t help your team. I want to be out there. If I feel like I can go out there and get the job done, maybe I’ll give it a shot, see if I can get in the lineup. But if I can’t, we’ve got a good player out there. Endy Chavez can do a lot of things to help you win. Cam keeps telling me, "You’re going to be OK." It’s like when he was coming back last year after that collision and had to go through so much to get back in shape to play. That was really inspirational. It was great to talk with him. I mean, that’s what friends are for, right? I was hoping things would go the same for us as they’ve gone for the Tigers. Imagine that. Two teams rolling and they meet in the World Series. Well, we still may get there. It’s just one loss. But it’s going to take more time and more effort. And now we have to go to a tough environment and block it all out, just like the Cardinals blocked it out here. Other than injuries, we haven’t had to deal with adversity. But we’ve been ahead all year. And now we have to fight back. We haven’t been in that position for a long time — except for in some games. You know what I really don’t like? It’s how they won it. I know Billy Wagner will be fine. He’s got strong shoulders. But now the Cardinals know they can do it. Billy’s no weaker because of what happened. But they could be a little stronger, doing what they did. When you come from behind, you get a good feeling. I know how we feel when we come back and win and when we beat someone’s closer. It picks you up big time. This is a bad kind of loss. No doubt. But it’s a good type of win for them. And I don’t like that. I don’t think anyone was planning on a sweep, even when we were up 6-4. The Cardinals aren’t in this by luck. They’re a good team. You can see that. We’re going to have to show how good we are now. And I hope I get a chance to help. My Achilles tendon injury is what it is. I’m just going to take treatment and try to play Sunday and all the games after that — until we win. I know I’m a big guy. I’m sure I look a little taller now. I’ve got this long face. I can’t hide all my disappointment. I’m delighted we won. I’m so glad for Tom Glavine and Carlos Beltran and for Endy Chavez. What a diving catch he made in the fifth inning. I’m so happy we won. But I hurt, too, and it’s not just my leg. You get that feeling in the pit of your stomach when you know you pulled something or you heard something pop. And I heard — or felt — two pops when I was running out the foul ball in the second inning. I don’t know what they mean or what happened. I just know none of it’s good. Not for me and not for us. I didn’t want to put us at a disadvantage. Now I’m afraid I have. We could be down one man for the rest of the series. I know that. I’ll know more on Friday morning when I get an MRI — another one — and the doctors tell me what I did this time. Right now, they say I’ve irritated the sheath that covers the Achilles tendon. They said maybe a shot would make it better. I thought I was done with shots. Maybe not. Because if that’s what it takes to make me better, then I’ll get another one and see. The only thing I know for sure is that I’m not playing in Game 2; whether it’s because I get a shot or just because I can’t, I’m out of there. And we’ll have one of the best defensive players in the game in my place. So that makes me feel a little better. But I want to contribute. If I’m a pinch-hitter the rest of the series, I’ll be all right, as long as I can help. If I can play and help, that’s even better. If I can’t, I can’t. Who knows? This might be bad. I may be done for rest of the postseason. 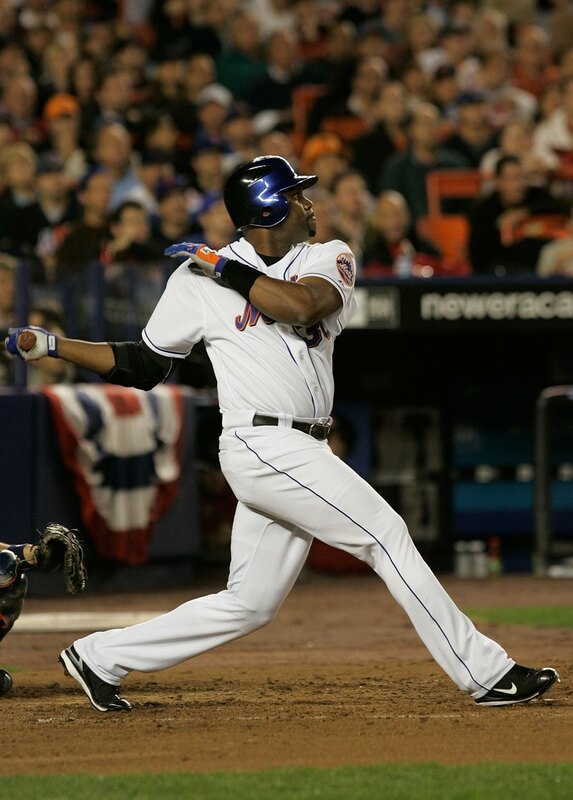 Hey, when I flied out, that might have been the last at-bat of my career. I hope not. But it could be. And, if it was, well, I’m proud it came trying to help my boys win. And we won. It’s really what matters most. It was a weird baseball day. You have that sense of anticipation when you wake up. And for me, it might have been a little more than it was for the next guy, because I heard late Tuesday that I was on the National League Championship Series roster and I was going to get to help my team in a big game. Great. I wasn’t so sure when I left Shea Stadium. My left Achilles tendon hurt after Willie Randolph worked me out. It felt OK when I got to the park Tuesday. It always gets worse as the day goes on. That’s why this rain stinks. It costs us an off-day. And I was looking forward to it, because I’d need it after playing two games. What are you going to do? Maybe not playing Wednesday will help, but I don’t think it will help as much as an off-day between Games 2 and 3 would. Anyway, then I headed to the park. I live in New Jersey, and it was just spittin’ over there. As I get closer to Shea, it starts getting wetter and nastier. And you hear the forecast. And you’re down. Darn. You want to play. Rain isn’t helping anyone, especially a dude with a sore Achilles. But you don’t know for sure. So you start waiting and looking for things to occupy your mind. For me, I had to get treatment, so I was busy. Then you hear about poor Cory Lidle. You don’t know what to say. Whether I played with him or not, he’s one of us. And he’s a human. He’s one of all of us. Man, it just stays with you. You apply it to yourself, of course. I think all of us do. We’re all on planes, all the time. We’re not flying them, but we’re in them. And you never give it a thought until something awful like this happens. Then my lady calls me. She’s upset because he’s a baseball player. It feels closer to home. I understand that. You apply it to yourself. Then you hear Cory’s wife is in the air, and she doesn’t even know he’s gone. You hurt for her. Your heart goes out to her and his family. The rainout didn’t mean that much after all — not when you think about what happened to him. I hope we have a moment of silence for him tomorrow before we play. We should think about him and what’s really important. You just have to face the truth sometimes, ugly as it is. I know there?s a chance I may not play, a chance that I may not even be in the roster because of this Achilles. What am I going to do? I don?t know anything for sure. I don?t know what?s in Willie?s head anymore than I know exactly what?s going on inside my leg. I just know it hurts. They wanted me to have another MRI on Monday. It was all set up. But I said, ?What for? All it?s gonna say is that I?m hurt, and I know that already.? So here I am. I?d love to be out there. I?m swinging the bat pretty good right now. And I can help. But I know a ball in the gap could be a problem. I?m pretty sure Willie knows that, too. He saw me in the outfield yesterday during our workout. If this was the World Series already, we wouldn?t be talking about this. I think I?d be the DH, cause it doesn?t affect me at all when I swing. and nothing happens to this Achilles. Three or four inches higher, and I?m downshifting. They told me Todd Zeile hit a ball like that ?- like Greenie did — in the World Series, against the Yankees in 2000. It almost went out. It goes out, and the Mets get two runs. But it stayed in, and that Timo Perez got thrown out at the plate. Jeter made that great relay. See, I?m kinda worried about that, too — that I might not score when I should because of this thing. I?m not afraid of the pain. I?ve been hurting in both legs ?- off and on -? for a long time. The right one?s better now. But I?ve got to be able to do my job in the outfield and on the bases. As much as I want to play and help us win, I wouldn?t want to be the reason we lose -? because I can?t run. So yeah, I know I may be out of there. But I?ll be there rooting. These are my boys. D. Wright, I have to be there for him, help him get through all this. I know he wants to say he?s outgrown me, that he doesn?t need Cliffie. I don?t make him carry my bags anymore, but he?s still my little guy. Bad leg or not, I gotta look after my little guy. So I?ll be there one way or the other. When I got to third base while scoring on Shawn Green’s double in the third inning, my Achilles tendon went. You know people sometimes say they hear something. I didn?t hear anything, but I felt it — like an ice pick in my calf. I want to play, and I don?t know what to think. I wanted to score that run. It?s the postseason. You don?t hold back. We wanted that run, and now my leg might hold me back. My Achilles betrayed me. First, they said I?d stretched it. But then they said I strained it. What I say is I hurt it.*****. I?m just glad I made it to the plate. I don?t remember what I was thinking as I ran or limped or whatever I did. I have mixed emotions — happy that I scored, and very ticked because I pulled it. The good news is that I?ve got Monday and Tuesday to get treatment before we play again. And I’ve already started treatment with ice. I?ll be wearing one of those boots again. I don’t know, maybe it?ll get better in two days. If it doesn?t, I?ll deal with it. Someone already suggested to me that I could be the DH if we get into the World Series. I?ll take that, I guess, but I want to play in the next series — every day hopefully — if we get to the World Series. You know, Endy Chavez got me good with the champagne after the game. Just his way of saying thank you for getting him in the game. I left the game in good hands. So I?m not too worried. We?ll be OK. Look what we did after we lost Pedro Martinez and Orlando "El Duque" Hernandez. I?ll just rub some champagne on it and see, or I?ll have a few beers. Maybe a few more, and by the time I get to Wednesday, I?ll be good to go.